“In our work, the question is, how much you absorb from others. So for me, creativity, is really like a relay race. As children we are handed a baton. Recently, the use of projection design in live entertainment has become increasingly more prevalent in live performance. It is easy to find examples of how this evolving technology can create impressive and awe-inspiring images special effects, but it is important to consider what it means as a tool for visual storytelling. Projection design provides new ways for the design of a production to engage and encourage the imaginations of young audiences in transformative and surprising ways. My work as a projection designer in the theatre has always centered around how my design both furthers the story, and invites audiences’ engagement in the world on stage. The use of projection, specifically in TYA work, is particularly exciting because of the potential to inspire young audiences by using the technology how imagination can be animated and brought to life in surprising and transformative ways. A successful projection design blends the world of video that has become so ingrained in the daily life of young audiences with the impact and human connection of a live performance. Recently, I joined the creative team for a new, TYA musical, Peace On Your Wings, directed by Cari Lee, and produced by Ohana Arts, as the scenic and projection designer. 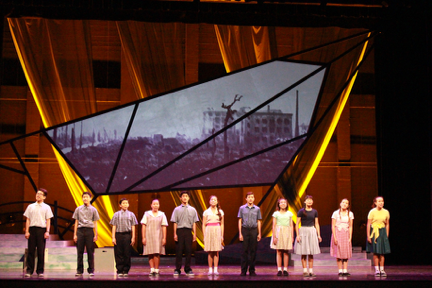 The musical tells the story, written by Laurie Rubin and Jenny Taira, of Sadako Sasaki, a girl who famously fell ill and died of radiation poisoning in 1950s Japan as a result of the Hiroshima bombing. Through exploring the design of this show, I would like to illustrate some of the ways that projections have impacted the development of design aesthetics in TYA productions. One of the most unique aspects to projection design is its versatility of purpose in the theatre. It can be used as a supportive element to other design areas- blending animation with lighting, displaying images as scenic drops, or even enhancing bringing the costumes of a character to life with carefully placed video. The most exciting result of this application is that it provides a new way to breathe life into more traditional design elements. At the same time, it is a new voice of design, and allows for new and exciting opportunities in storytelling. In Peace On Your Wings, projections were displayed on a screen that was seated within a large, abstract “crane wing,” that sat behind and above the playing space, often serving as a scenic backdrop for the scenes. The use of movement and animation, particularly when applied to scenic and background images is interesting due to how it can resonate with familiarity to young audiences, contextualized in how they might experience exploration in a video game, or on cartoons. Animation and movement allows productions to not just represent different and changing spaces, but to immerse young audiences in the feeling of traveling through the world of the play. The importance of movement was very prevalent in Peace On Your Wings, not only in moving between scenes, but within scenes themselves. Throughout the production, the space came alive as media and movement played off one another, such as when the ground moved on screen during a race sequence to support the imaginative and engaging choreography created by Danielle Bensky. Aside from allowing more opportunities for world-building and new ways of activating the playing space, the design utilized projections to powerfully represent images in more abstract ways to punctuate powerful moments in the story. Personally, one of the most exciting aspects to the design of Peace On Your Wings was how it presented images in an abstract way, and did not attempt to literally convey information; instead asking audiences to use their imaginations to understand the bold visual gestures on stage. This direction for the design allowed us to leave the literal, scenic world behind for certain songs and invite audiences into a more emotional visual world. An example is when Sadako’s friends are writing her letters at the start of the second act. In this moment, we see the letters themselves displayed within the projection surface, and thus a world that was mostly scenic locations has now transformed into a more emotional landscape. That is, in many ways, the greatest strength of projections as an asset in design- they allow us a way to transform space and story like never before. Although the stage itself never moves in Peace On Your Wings, the world moves and becomes new every scene, engaging young audiences with fun and surprising visuals to frame the story being told on stage. 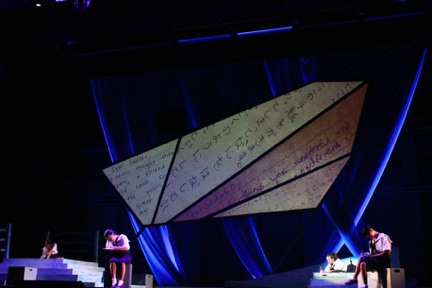 The design of Peace On Your Wings was a bold gesture for a TYA production, and an example of the new kinds of visual worlds we can build as artists with the incorporation of projections. One of the reasons that, as a designer, I am drawn to and work to focus on creating work for TYA is because of how the stories live in worlds that lend themselves to the transformational and imaginative capabilities that projections can provide. Projections have given the field of design a new and exciting way to create theatrical magic, and there is no more of an appreciative audience for magic than children who are willing to believe and be immersed in surprise and story. I am excited to see how this continues to shape the world of design, and how the magic and power of the technology will be used to encourage the imaginations of young audiences moving forward in the years to come. Peace on Your Wings Team: Lighting Design by William Kirkham. Costume Design by Lori Okamura. Sound Design by Anthony Sutton. Associate Scenic/Projection Design by Rebecca Emmerich. Assistant Projection Design by Shimshon Zeevi.